The Taylor Family Humboldt Penguin Exhibit recently welcomed its newest pair of Humboldt penguins, male, Pasado, age 20, and his female partner, Piper, age 9. Don’t let their huge age difference fool you about who is the leader. According to keepers, Piper is very curious and outgoing, while Pasado is shy and tends to wait and see Piper’s reaction to a situation before he will go and investigate. The pair came from the Roger Williams Park Zoo in Providence, Rhode Island. When you visit, you’ll be able to recognize them by their purple colored bands, Pasado’s band is on his right wing and Piper’s band is on her left wing. Unlike most other birds, penguins do not have hollow bones. Penguins’ bones are solid as opposed to hollow, and act as a ballast to help them dive. They can swim up to 20-25 miles per hour. Visit Pasado, Piper and all of our penguins daily, at the Taylor Family Humboldt Penguin Exhibit, just inside the main entrance to the Zoo. 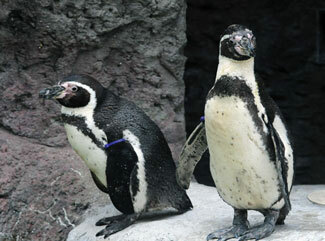 The Milwaukee County Zoo has been involved in Humboldt penguin conservation since 1994. Read more about our efforts.